When is a digital cable better than a digital guitar? When it actually solves a problem guitarists have. We’re still not sure what’s so great about Gibson’s Digital Guitar, even after hearing it played at NAMM but we immediately grasped the utility of IK Multimedia’s new StealthPlug. It’s a compact audio interface built into a cable that makes it dead simple to plug a guitar into a computer and take advantage of software-based amp and effects modeling. 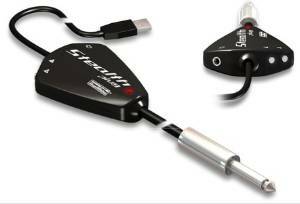 The StealthPlug includes AmpliTube Live and LE, with guitar amp and effects models based on modern and vintage classics. It is expected to ship first quarter for a price yet-to-be determined. Gibson’s Digital Les Paul Guitar: Innovation or Reinvention?